Outdated conceptions of what the bachelor's degree must include, paired with 40-year-old changes to the Higher Education Act, have created a catch-22 for students who need to start their careers before completing a four-year degree. A new report from New America’s Education Policy Program finds that for these students, occupational associate degree programs are abundant, but the pathways they provide to the bachelor’s degree are narrow. A flurry of new research has determined that foregoing a college degree is becoming a guarantee of personal and economic hardship. But despite rising enrollments in higher education over the last three decades and enormous investments in improving college access and completion, the U.S.’s bachelor degree attainment rate has only increased by a few percentage points. 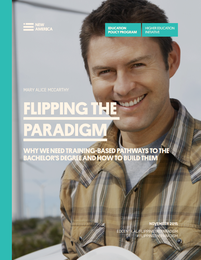 Flipping the Paradigm: Why We Need Training-based Pathways to the Bachelor’s Degree and How to Build Them suggests that one of the reasons the country is struggling to raise its attainment rates is the inability for students in career and technical programs to transfer seamlessly onto a four-year degree path. “It is one of the many ironies of our education system that career training is considered deeply problematic when it takes place below the bachelor’s degree level, but completely appropriate at the postgraduate level – in master degree programs or other professional schools,” said Mary Alice McCarthy, a senior policy analyst at New America and the report’s author. According to the report, however, none of these barriers are inevitable or irreversible. Flipping the Paradigm highlights a number of states and institutions that are leading the way in building pathways to four-year degrees that start with a career training program. Rewarding federal and state funding to institutions based on student outcomes, especially those with strong success rates with students from historically disadvantaged and underrepresented groups.